The Athletics made an under-the-radar trade in 2016, acquiring Khris Davis from the Brewers. Since, the left fielder-turned-designated hitter has swatted 102 home runs, more than any other major leaguer in that time. Davis has also knocked in 258 runs, more than 100 in each full season, and accrued an offensive WAR (oWAR) of 7.5. His offensive production netted him an MVP voting point in 2017. It has not, however, been enough to get the 30-year-old his first All-Star Game bid. According to the initial voting tabulations, released by Major League Baseball Tuesday, Davis is once again on the outside looking in — he is not even among the top five vote-getting designated hitters. The only Athletic to appear on the list is Jed Lowrie, also in search of his first nod. But Lowrie, who appeared to be a shoo-in less than a month ago, may as well be in the same position as Davis. 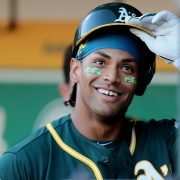 While his 70,454 votes are enough to land him in the fourth spot among AL second baseman, Lowrie remains more than 209,000 votes behind AL Rookie of the Year hopeful Gleyber Torres of the Yankees, and 630,000 behind reigning AL MVP Jose Altuve — currently in Oakland for a three-game set. Joining Davis and Lowrie in search of his first All-Star Game assignment is closer Blake Treinen. Second-year corner men Matt Olson and Matt Chapman also find themselves among dark horses. With 2018 MLB All-Star Game rosters to be announced in about a month it is time to begin considering the worthiness of each Athletic’s resume. Greg Maddux and Tom Glavine said that chicks dig the long ball. But according to Major League Baseball’s TV ratings, which climbed last season when the league hit an all-time record 6,104 home runs (411 more than the previous record set in 2000), everyone digs the longball. That being said, Davis’ low batting average (.237) is not a deal-breaker. What matters is his 17 homers, T-6th in the American League, and 46 RBIs, fourth-most in the AL, despite his missing 10 days with a groin strain. And speaking of that stint on the disabled list, his value and importance to the team was accentuated during his absence. The Oakland offense, currently seventh in the AL with 289 runs scored, averaged just 1.7 runs per game without its clean-up hitter. 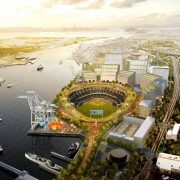 With no A’s player currently among the top vote-getter at any position Oakland’s representation will likely be chosen either by players or coaches selection, and that value will play into such choices. Aside from his high value, Davis has been the most prolific power hitter in baseball over the course of his American League career, and he has been passed over in both prior opportunities for this recognition. He is deserving this year, based purely on his power potential. It’s time for “Khrush” to get his nod. Lowrie left April riding high, slashing .339/.397/.583. He has fallen on hard time following the season’s first full month, slashing .239/.310/.370 since, and things have gotten even worse of late. The 34-year-old has not heated up with the temperature, in fact he has gotten just 18 hits in 94 at-bats (.191) since May 13. At a second base position stacked with names like Altuve, Torres and Kansas City’s Whit Merrifield, Lowrie’s chances are dwindling. His .285/.349/.466 slash is still very respectable, but all signs point to those number continuing to slip. Treinen is tied for fifth in AL saves with 14. His 0.87 ERA is just a hair behind Kelvin Herrera‘s 0.73 for second among everyday AL closers. Long story short, Oakland’s 29-year-old reliever has been as lights-out as they come, matchable only by a Kansas City closer who has made two All-Star appearances. The way the All-Star Game is played has led to each side taking five, or some times more, closers into the game. If that is the again this season, Treinen is as sure a thing as Oakland can offer. Even with the power Davis has shown, he is competing head-to-head with J.D. Martinez (Boston), Edwin Encarnacion and Nelson Cruz for what will be no more than two spots. Youngsters Chapman (10) and Olson (13) have each hit double-digit dingers, and both are beginning to heat up bolstering their chances. Comparing them to the competition, it is Olson who stands a better chance — he is currently second among AL first baseman in homers and third in on-base percentage — though Chapman’s 15 runs saved (defensively) is tops in the league. No matter who it is that gets the call, Oakland will be sending a first-time All-Star to DC come July — only Trevor Cahill, Matt Joyce or Jonathan Lucroy and previously been selected. And there is still some time for the A’s to improve their record and placement in the standings in hopes of sending more than one participant.